You’re sitting in your living room looking at the beautiful snowglobe that’s been in the family for years, watching the confetti float around and stuff… but did you ever stop to wonder what if that snowglobe was eeeevil? Well… have you? Of course you have because we all have pondered the possibility of an evil snowglobe, right? And it’s not a pretty scenario to contemplate, let me tell you. This leads us into the Sci-Fi original disaster movie ‘Snowmageddon’ which I believe we can safely say, without fear of recrimination, that it’s the best evil snowglobe movie ever made. made completely clear but he does seem to be in charge of something since he’s always barking out orders at his lackey Tully. His wife Beth (Laura Harris) is a helicopter pilot, their young son Rudy (Dylan Matzke) likes to play Dungeon and Dragon games, and their teenage daughter Stephanie (Magda Apanowicz) is the television teenage girl prototype who is extremely disrespectful to her parents and will be freaking out early and often in this movie. them tell it, is exquisite. Then little Rudy twists the knob on the bottom and dang if a crack doesn’t form along the ground of the snowglobe, a crack which recreates itself in Normal’s downtown, causing explosions, destruction and even a little death. The strange thing is that there is no record of this quake on any of the quake registering equipment in Alaska, heck if I know what the official name for quake registering equipment is, but this minor disaster is isolated to just this one small town. Little Rudy, an observant young man if ever there was one, is pretty sure the snowglobe made this happen, and that’s it’s evil, but is anybody listening to an eight year old or Mo the Dog who can smell the evil snowglobe? Of course not. snowboarders is hot (Jeffrey Ballard), somebody presses a button on the snowglobe and another disaster hits putting the wife and baby girl in a heap of mess. Gotta admit, the exploding cloud rockets splintering into ice daggers was pretty cool. Little Rudy knows plain as day that the evil snowglobe is causing all this ruckus and he is about to put a stop to all of this nonsense, because now it’s gotten to the point where you don’t even have to press a button on the snowglobe for disaster to strike, and where Normal Alaska used to have a population of around fifty, unless you happen to be a Miller, or a guy that used to be on Battlestar Galactica (Michael Hogan), you’re probably gonna die of snowglobitis. What we need is a hero. And an active volcano. Don’t ask. 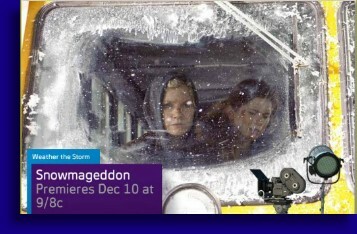 True enough, veteran Sci-Fi channel original director Sheldon Wilson’s ‘Snowmageddon’ is one disjointed mess of a movie, but does this mean it’s a bad movie? Well I guess it does make it a bad movie, but that doesn’t mean that there isn’t some good stuff here for the astute viewer to enjoy. First, let’s talk about the stuff that makes ‘Snowmageddon’ not very good, such as the fact that it didn’t bother to explain jack to its audience. Come on man, an evil snowglobe? A little cleverly thought out backstory would’ve made this movie awesome. Okay, maybe not awesome, but better. Also, if you’re going to have ‘geddon’ in your title, then I’m thinking the whole earth should be in peril, not some rinky-dink town in Alaska that nobody’s going to miss. That mysterious dude should’ve put the whole planet earth in a snowglobe. 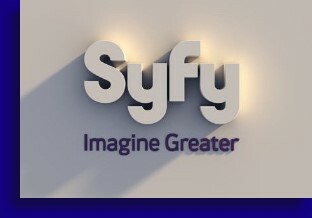 Now that would’ve been awesome. The film has a very generic, Lifetime movie gloss covering it, the action sequences were suspect, the pacing was off kilter, the special effects were questionable, though we still enjoyed the ice dagger shower, and the people of Normal Alaska aren’t very bright. Feel a need cut the electricity from a downed power line? Hit a live junction with sledgehammer is what you do, ignoring the metal tip attached to a wood handle. And if the bratty daughter had died in one the many mishaps which she stumbled into, freaking out every step of the way, we would have considered it a personal favor. But we’re not all about dwelling on negativity here at the FCU… no sir. It’s a movie about an evil snowglobe, and they play this straight as if Stephen King himself had written it. He didn’t write it in case you were wondering, in fact there is no listed screenwriter for this movie which probably could’ve used just a touch of levity considering it was completely humorless, but it’s about an evil snowglobe and that’s worth something. Plus it’s completely inoffensive. Forgettable perhaps, despite the killer concept of an evil snowglobe, but I don’t think it will upset you after you stop watching it. I realize that this probably isn’t exactly an accolade, saying a movie isn’t bad enough to piss you off, but that’s what we got in this movie about an evil snowglobe attacking a town with a population of fifty. Still, best evil snowglobe movie ever.